Rarely have I seen a man look as relieved as Paul Murphy at the end of Valhalla. 48 hours prior this production had been turned on its head with the unexpected departure of the leading man. And so at very short notice Murphy, the playwright, stepped in. It sounds foolhardy - how can you substitute for someone who's spent weeks rehearsing, develop a chemistry with your co-star and act around an on-stage copy of the script? It's the theatrical equivalent of a high-wire act sans safety net. But here we are, watching an actor fly by the seat of his pants and, remarkably, it works. Helping is that Valhalla is a very strong piece of theatre. Set in a near-future where society has begun to collapse after a devastating global epidemic, we follow a couple, known only as Man (Paul Murphy) and Woman (Carolina Main). This crisis has exacerbated fault-lines in their marriage; he's working hard on curing the disease and she's struggling to conceive. In desperation they abandon the mainland to work from a remote house in Iceland, sequestering themselves away to concentrate on his research. Though we spend the entirety of the play inside one sterile, brightly lit room, we're conscious of the massive Icelandic environment outside. Volcanoes bubble and hiss, thousand tonne glaciers creep and crack through valleys and fierce winds whip around the buildings. Something massive and primordial is bearing down on these two scientists: the weight of mythology banging on the doors and warping their lives. Sat in an empirical tower of reason, Man ignores these psychic reverberations while Woman begins to embrace them, with disturbing consequences. From the off, Valhalla launches into a staccato rhythm that keeps audiences on their toes. Scenes are short and end abruptly with a blackout and musical sting that marks each minor cliffhanger and emotional revelation. The effect is that we watch two people gradually becoming unspun; each time the lights go up they've imperceptibly changed in subtle ways. By the time we reach the closing scenes they've both come a long way yet maintain the personalities and desires they had when we first met them. Theatre like this requires two rock-solid performances; the play would like a badly mixed souffle if one of the leads weren't up to snuff. Thankfully both Murphy and Main are excellent. Somewhat aided by his character being a scientist who constantly reads his research papers, for the most part he gets away with having the script on stage. Naturally it's not an ideal way to perform, but I'd much rather suspend my disbelief than have an actor forget his lines and have to be prompted. Main, opposite him, is straightforwardly excellent. There's an electric wildness to her movements, a twitchy awkwardness that feels a little bit like a caged animal. Given that she's playing 'Woman', it's appropriate that her performance runs a gamut of femininity, layering elements of maternity, eroticism, professionalism and empathy. Simply put, she's dead fun to watch. 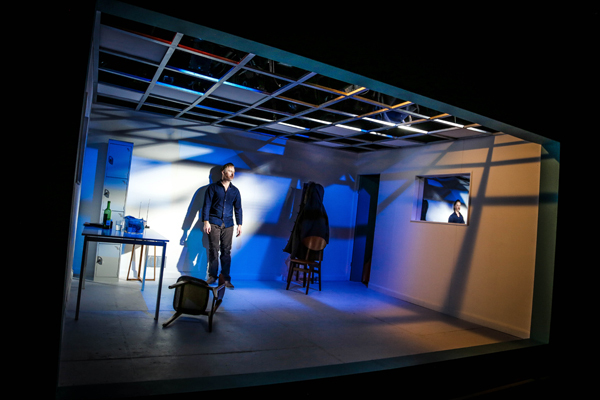 As events progress, the themes of the play tend towards confrontation. On the narrative surface is the conflict between the two characters. Just a little deeper lie broader dichotomies; man vs woman, science vs superstition, civilisation vs nature and so on. Eventually we zero in on questions of medical ethics, with a neat thematic dovetailing of disfiguring experiments and ancient Norse punishments. This knotty ball of meaning climaxes in an ending that's surprising, joyous and slightly scary all at once. I won't spoil it here, but with perfect timing the director shocks the audience by turning out expectations of the form of the play on its head. It's brill. Despite suffering a backstage nightmare, Valhalla is an unreserved success. 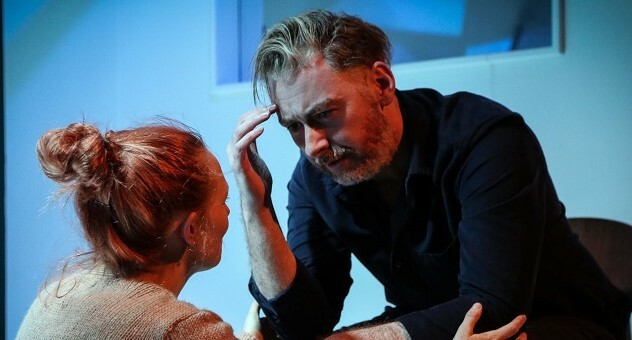 It slots neatly into Theatre 503's growing catalogue of smartly symbolic, beautifully staged and fantastically performed plays, making it an easy recommendation. But special praise must go to Paul Murphy, who singlehandedly rescued the production by bravely putting himself in front of an audience at short notice. It could have gone so, so wrong. But it didn't. He deserves his applause. Valhalla is at Theatre 503 until 24 October. Tickets here.